With the start of a new year many people are turning their attention to living a healthier life. This includes eating items that are better for you. Breakfast is always a challenging meal because so many of us are pressed for time and often turn to the quickest option rather than the healthiest option or just skip breakfast all together. With a BUNN Oatmeal Machine, you can now offer your customers a healthy, low-fat breakfast alternative without having to sacrifice the convenience they desire. The BUNN iMix-3 S Oatmeal can dispense three different instant oatmeal varieties from a 4.3-gallon tank to meet peak serving times. Whether you are serving steel cut or rolled oats, your customers can adjust the oatmeal thickness to their preference with the use of the hot water dispense button located on the front of the machine. The eye-catching, lighted front graphics area for merchandising is sure to attract customer attention on a crowded counter top. To entice your customers even more, offer delicious toppings to enhance the oatmeal such as cinnamon, brown sugar, dried fruit, and chopped nuts. An alternative equipment solution to adding oatmeal as a menu item is our HW2 Oatmeal hot water machine with an appealing oatmeal decal on the front. This machine holds two gallons (7.57 litres) of hot water in a space-saving footprint of just 7.1" (18.03 cm) wide, able to fit on almost any counter. According to PR Newswire, March 2011, Oatmeal is becoming a mainstream staple. Like gluten-free items, it is one of the fastest growing food options in the restaurant industry. In an analysis of nearly 6,000 menus, the term low fat topped the list of most popular terms that resonates with consumers. Offering oatmeal as a low-fat breakfast alternative is an affordable way to capitalize on this rising trend. Overall oatmeal is a great addition to your beverage bar, gives you a healthy breakfast option to offer to your customers, and can add to your bottom line. 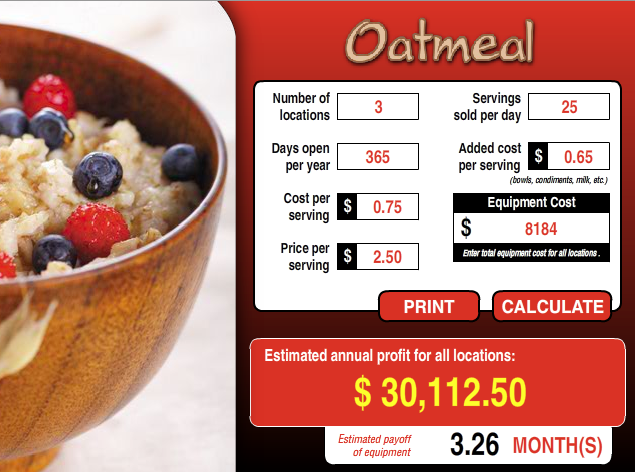 For instance if you have three locations selling 25 servings of oatmeal per day from an iMix-3 S Oatmeal, your estimated annual profit for all locations would be $30,112.50*. Oatmeal its whats for breakfast! 13. Can be prepared different every day! *Pending geographic market variable, such as labor, materials, and other operation costs.